The Winco K-12S Sharpening Steel, 12" boasts quality materials and a sleek, easy-to-use design. 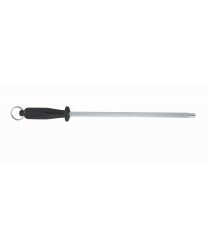 This manual knife sharpening tool has a durable, anti-rust stainless steel rod and a comfortable black plastic handle, so you can maintain a safe, sure grip. Equipped with a convenient metal hanging hook, the sharpening steel can be hung within reach for quick and easy access.